Internationally acclaimed Boston-based jazz pianist and composer Laszlo Gardony is one of the most expressive and technically skilled pianists working in jazz today. "A formidable improviser who lives in the moment" (JazzTimes), Gardony has performed in 27 countries and released a dozen albums on the Sunnyside, Antilles, and Avenue labels during his distinguished, decades-long career. Winner of the Great American Jazz Piano Competition, Gardony has been noted for his "fluid pianism" by The New York Times. The legendary Dave Brubeck called him "a great pianist." His latest solo piano album Serious Play (Sunnyside) was named one of the Best Jazz Albums of 2017 by DownBeat Magazine: "Serious Play combines spontaneity and intent. Improvised in the studio, it's a harmonious, emotionally intense whole that sounds like a concert rather than an arbitrary collection of tunes. No matter how busy Gardony becomes, there's a stillness at the center of his music, a distinctive amalgam of central European folk strains, majestic classical piano and improvisational fearlessness." 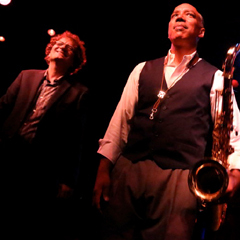 Both Serious Play and Gardony's 2015 live sextet album Life In Real Time were named by the Boston Globe as one of the "10 Best Jazz Releases of the Year." Gardony has performed and/or recorded with artists including Dave Holland, Miroslav Vitous, Bob Moses, Mick Goodrick, Yoron Israel, John Lockwood, Jamey Haddad, Bill Pierce, Don Braden, and Stan Strickland. In addition to his own recordings on Sunnyside, Antilles and Avenue, his compositions, arrangements and playing have been featured on jazz releases from Blue Note, Accurate, Rounder, and Ronja Music. A Professor of Piano at Berklee College of Music, Gardony continues to divide his time between composing, recording, concerts and teaching, committed to living an inspired, truthful, and productive life in music.